In 1826, the English architect and painter Charles Hayter (1761-1835) published a book in which he recommended Young’s trichromatic theory as a practical basis for colour reproduction (see text in plate 13). According to its subtitle, his «compendium» of colours was intended to «show as examples the natural and inevitable consequences of simultaneous combination which result through gradual and systematic concentration of the three primary colours according to the recommendations of Leonardo da Vinci». Hayter claims in his foreword that he already had a mental image of the diagrams and explanations (which he intended as a guide for painters) in 1813, and had previously never heard or seen anything of Moses Harris, who had touched upon much of what Hayter now expounded. We must here point out a contradiction: although Hayter, as a painter, wished to provide a system for subtractive mixtures, he does not quote the appropriate forerunners of this line of thought, but refers to Leonardo, Newton and Young, all of whom tended to think in terms of an additive system. Nevertheless, he sees with unusual clarity that a difference must be drawn «between the properties of such materials as give their colours in substances suitable to the purposes of art, and the transient effects of LIGHT, which must not be considered as belonging to a system of mixing colours for the purpose of painting.» Although Hayter did not — either generally or in detail — analyse this difference for the purposes of painting, he comes to the conclusion that «all transient or prismatic effects can be imitated with the Three Primitive Colours … but only in the same degree of comparison as white bears to LIGHT». Hayter’s basic triangle, comprising the three subtractive primary colours yellow, red and blue, is naturally by this time no longer an unknown construction, and we can recognise the black centre as being from Moses Harris (illustration) at the latest. It is thus difficult to judge the originality of Hayter. We are already familiar with the Frenchman J. C. Le Blon. In a short paper completed prior to 1731 Le Blon was the first to introduce the group of three — made famous by Goethe — of yellow – red – blue as a subtractive trio of primary colours. His view about the fundamental character of his primary colours has been available in print since 1756 under the title L’Art D’Imprimer Les Tableaux, in which he provides instructions about the use of his basic colours for printing, weaving and painting. Le Blon is proud of his construction, and specifically mentions that many of his colleagues did not believe that there were indeed such simple rules about art. Hayter examines these concepts in greater detail (perhaps inventing new ones, too) and at the same time explains his mixed colours. We can follow him in three separate directions, starting at each primitive colour. Firstly, from blue upwards to orange, then from red to green at the lower left, and finally from yellow down to purple at the lower right. The word «slate» appears three times between blue and black in the centre, which at the time probably also appeared grey. This slate colour appears at three levels as a mixture of purple and green, as a neutral grey and as a shadowy grey. Brightness increases again after the centre is passed, with a mixture of brown and olive between a neutral and a yellow-red orange. The red changes towards the centre through three shades of brown, henceforth becoming a green, of which there is a neutral, an olive grey and a yellow-blue variant. Yellow gives rise to the olive colour, which darkens via a neutral shade towards the centre, continuing then as purple towards a blue-red. 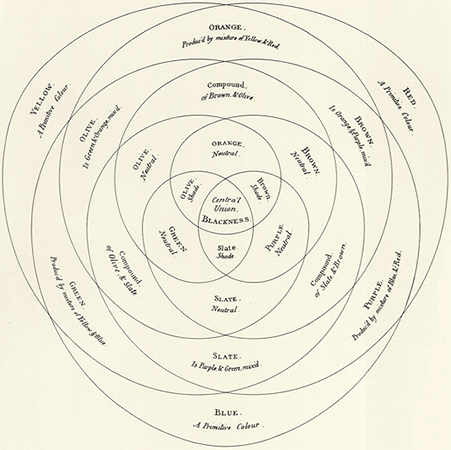 The adjacent sketches show how we can travel through the system, always crossing the centre (black) in order to pass from one colour to another. 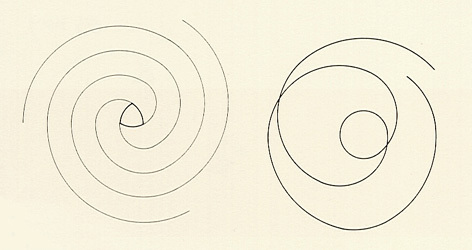 This interesting structure reproduces a spiral system in which both circular and radial movements coexist and in which both singularities and pluralities can therefore be found. Seen within the context of scientific development, Hayter’s system stems from a time in which the controversy — which had persisted since Newton — over the nature of light and whether it consisted of waves or particles seemed finally to have been resolved. On the one hand, Thomas Young, who we have already discussed, had proved that light rays can interfere with each other: under controlled conditions, light added to light can result in darkness. This property of interference applies only to wave formations, and not to particles. 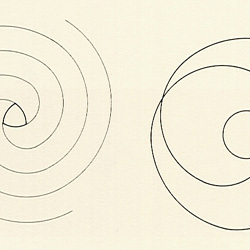 In the 1820s, the Frenchman A. J. Fresnel was also able to demonstrate that all optical phenomena can be understood if light is conceived as an oscillation in a (hypothetical) medium, with the direction of oscillation being vertical to the direction of propagation (transverse). In 1821, the German physicist J. von Fraunhofer actually succeeded in measuring the length of the waves of which light consisted. He used a diamond to scratch fine, closely-spaced parallel and vertical lines on a sheet of glass, and then studied the «deflection» of light through this so-called «diffraction grating». By 1835 at the latest, the physicist F. M. Schwerd was able to take exact measurements of the visible spectrum with the aid of such a diffraction grating, and show that red light has a longer wavelength than blue light, and that yellow and blue light lie in the middle of the spectrum. (The nanometer — 10-9metres, or 10-7centimeters-has now become the standard unit of measurement, with the wavelength of the visible spectrum lying within a range of a few hundred nanometres). We can see, therefore, that the first half of the 19th century was the heyday of wave theory. For the first time, it seemed that science could rest assured that something about the nature of light had been understood. But fundamental problems with regard to our conception of waves were to re-emerge at the beginning of this century. They remain with us to this day. 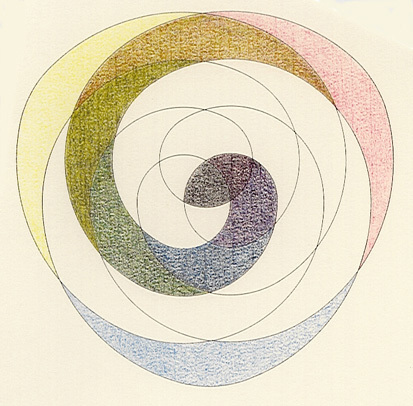 Date: Charles Hayter’s work appeared in 1826 in London and described how all colours could be obtained from just three. Bibliography: Ch. 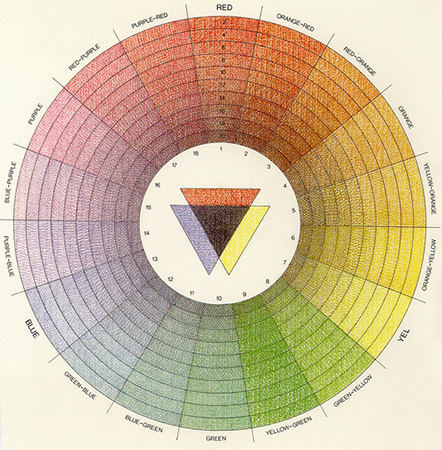 Hayter, «A New Practical Treatise on the Three Primitive Colours Assumed as a Perfect System of Rudimentary Information», London 1826; F. Birren, «Principles of Color», New York 1969; W. Spillmann, «Color Systems», in: H. Linton, «Color Consulting», New York 1992, pp. 169-183.